Nokia has just presented a new line of CDMA phones in China is Nokia 6316s, 4806 and 1506. Nokia announced three new CDMA phones are targeted for middle to lower market. Nokia 6316s with webbrowsing sliding multimedia, music, imaging, gps. Has elegant design and attractive features are like 2.2 "QVGA, 2 megapixel camera, 3G and Bluetooth 2.1. 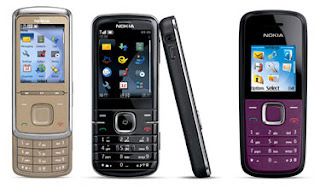 Nokia 6316s has integrated applications such as QQ, Email, WebBrowser, and share applications. This phone is more targeted to businesspeople. Has a thin design, stylist and elegant, 2.2 "QVGA screen, 2 megapixel camera with video recorder, Bluetooth 2.1, card slot up to 4 gb. Nokia 3806 has a choice of 3 colors Piano Black, Pure White and Rose Gold. Having a candy bar design Monoblok design with glossy colors on body, navigation buttons with glossy finisihing, voice recorder and integrated hands-free speaker and long-lasting battery. Nokia 1506 is an economical device that is simple and easy to use. Available in 2 colors Black and Plum. Unfortunately this new phone is available in China. There are currently no information on whether these phones will be released also in Indonesia.